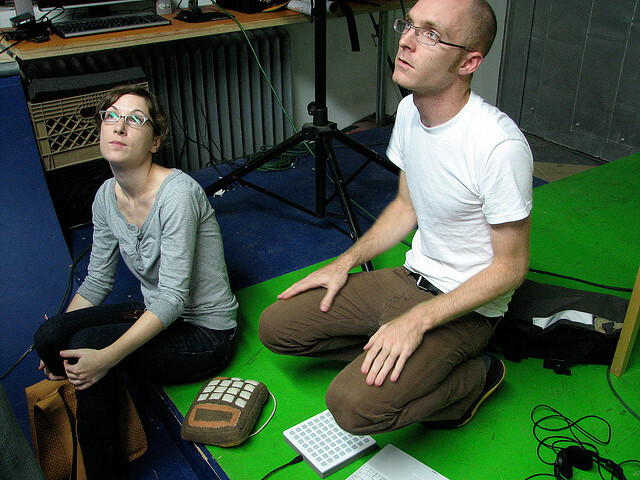 LA-based bang Fol Chen (Asthmatic Kitty records) wanted to go beyond the computer as the playback and manipulation device for their music. So they worked with collaborators to invent a solution. In a new video, sounds, and an interview, we can share some of how this came into being. 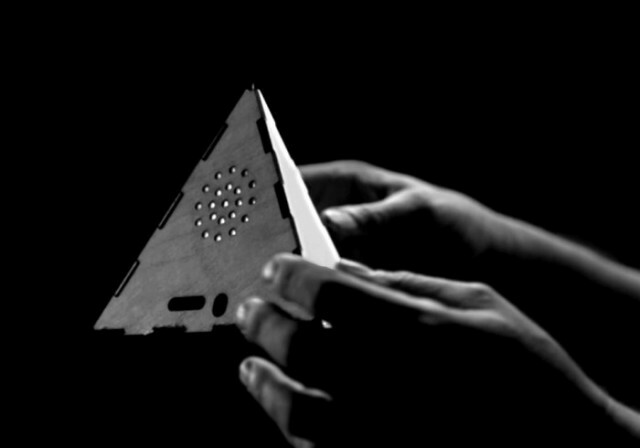 Built with the monome creators (Brian Crabtree and Kelli Cain) and LA research and experimentation center Machine Project, the Tetrafol is a custom, pyramidal sound device. The object warps Fol Chen’s music using gestural manipulation of playback, but can also use your own samples. And with open-source circuit and firmware, the project could be an opportunity to learn or to build your own creation. The Tetrafol is a hand-held tangible electronic sound toy. Circuits enclosed by a wooden tetrahedron detect orientation and motion-gestures to modify the playback of a collection of Fol Chen’s micro-compositions, allowing the user to explore sound through physical manipulation. The battery-powered device has its own internal speaker but can additionally be hooked up to a headphone or amplifier. Built by hand in a limited run of 100, the device sells for US$110 direct from Machine Project. We spoke to monome’s Brian Crabtree about the project – and a new, comically-inclined video shows off the project. CDM: How did this collaboration come about? How did you work together? brian: kelli and i have a loving and working relationship with machineproject, a phenomenal organization founded by our good friend mark allen. we’re always amazed at the fantastical variety of projects that are born there. a few inspiring works of recent include a cash machine designed for a children’s museum and a workshop on lockpicking. so when mark approached us on behalf of his good friend adam goldman and adam’s band fol chen regarding a possible collaboration we were all ears. the goal was to design and produce some sort of synthesizer-sampler-effect-instrument-toy-object to accompany the release of their new album. that was about a year ago and we’re happy to see it finalized and soon in playful hands. in the early stages there was much whittling of ideas (too expensive, too complicated, etc). we arrived at some sort of gestural sample player and a demo video was ready to show the proof of concept (we live on opposite coasts so there was much back and forth through internets and mails) the basic build used a waveshield (by adafruit) and an arduino and some very hacky code i modified. fol chen provided the sound set. kelli and i proposed a series of enclosures– diamonds, stars, ice cream cones, d20. the tetrahedron ended up being the most beautifully minimal, and incidentally the most cost effective. our friend jason voytilla laser cut a prototype from thin birch ply and we sent the “finished” sample to california where it underwent a series of intense focus groups – thanks to the rigorous machineproject laboratories. after more back and forth, and basic design changes here and there we were in agreement. we used our very reliable production chain that we depend on for monome releases… it was nice really helpful to have that all in place and sped up the process considerably. the tetrafol accompanies the release of some exciting new fol chen tracks, and there will be a release party of sorts in early december at machineproject. should be very interesting, as the current installation is a 30 foot deep window sill of sorts. 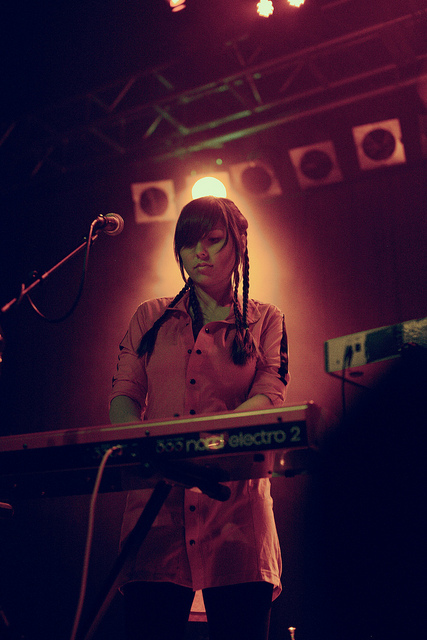 Fol Chen’s Sinosa Loa at the keys in Seattle. Photo (CC-BY) Kevin N. Murphy. What went into the design? The construction of the thing? the final circuit board is an arduino, [Lady Ada – Limor Fried] waveshield, and accelerometer smashed together and made very small. i really just put existing technologies together– i can’t take a lot of credit here. the industrial design was more fun. we didn’t want to use plastic so we experimented with felt and wood. coming up with a size, shape, and feel were the main goals- to create something that was pleasant to hold and sturdy enough to be tossed in the air. What’s the basic notion of the instrument? it plays sound loops, or “micro-compositions” written by fol chen. when you pick up and tilt the device it modifies playback: in one axis it changes the playback speed, in the other it triggers a variable-speed stutter (playback position jump). sounds are changed by a shaking motion. given the response is immediate, it comes alive very quickly. i’d also hesitate to endorse it as an Instrument, though it’s very playable. it’s a bit like a responsive buddha box. this was a fun collaborative side project– and it makes me even more curious to see how musicians continue to create tangible objects to accompany their releases.